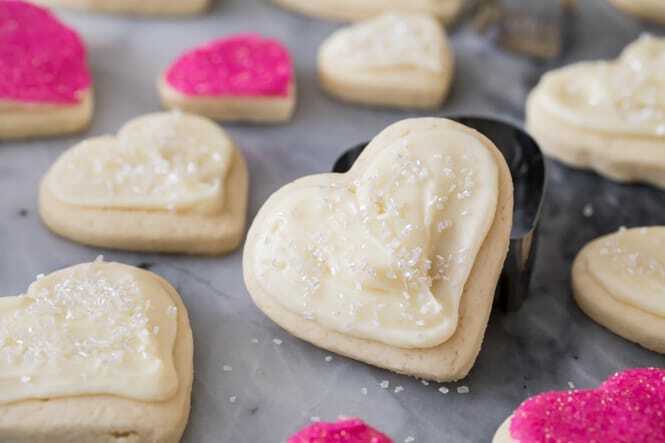 Cream Cheese Sugar Cookies are a perfectly soft, melt-in-your-mouth cutout cookie! Cut them into any shape you please but make sure to top them off with a generous topping of cream cheese frosting! Be sure to check out the simple how-to video at the bottom of the post!! Today’s recipe is a thicker, softer, and cream-cheese infused version of my favorite sugar cookies. You might also recognize the icing, it’s a firmer, smaller batch of my popular cream cheese frosting! I’ve shared quite a few soft sugar cookies on the blog. From soft frosted sugar cookies, to sugar cookie bars, to notes on how to make my classic sugar cookies thick and soft, we’ve covered a lot of ground. However, these cream cheese sugar cookies are in a league of their own. Not only are they melt-in-your-mouth soft and topped with the best frosting in existence (hint, also try them with chocolate cream cheese frosting! ), but there’s also no chilling required! They’re one of the easiest cut out cookies I’ve shared yet. 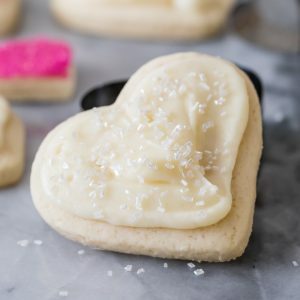 One of my favorite things about this cream cheese sugar cookie recipe is that there is no chilling! Despite the 6 oz of cream cheese we’ve worked into the dough, it’s thick and not very sticky (in fact, if you’re not using a stand mixer it can take some time to work all the ingredients together into a smooth dough). You’ll transfer your dough onto a clean floured surface and use your hands to work the dough together until it is smooth and cohesive. If it does seem too sticky and is sticking to the counter or to your hands, just add additional flour beneath and on top of the dough. A few dustings of extra flour should help you get to a point where the dough is easily manageable. If you don’t care for thick cookies, you can of course make these any thickness you’d like, but I think cream cheese sugar cookies taste best when they are thick. I roll my dough out until it is just shy of 1/2″. This makes for a soft, thick, cookie base that you can really sink your teeth into. It’s also nice to have a cookie that is thick enough to be accented by the cream cheese frosting, rather than overwhelmed by it. 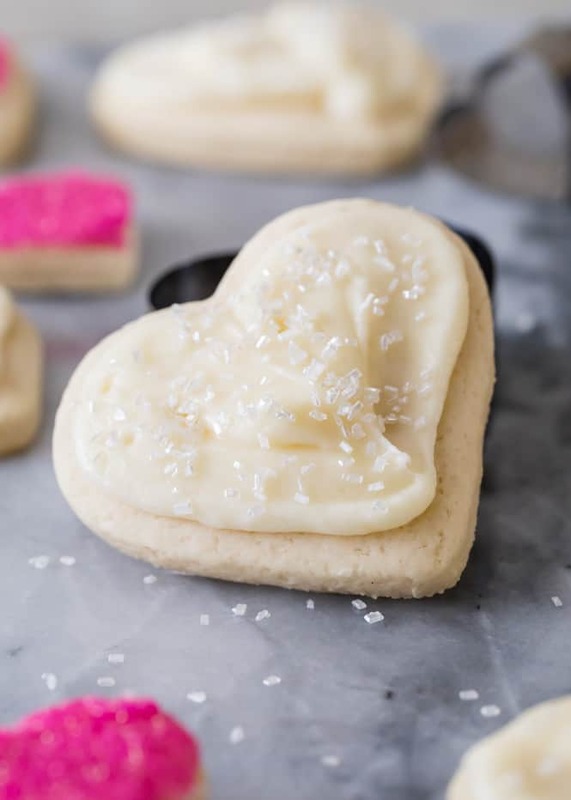 Cream Cheese Sugar Cookies are a perfectly soft, melt-in-your-mouth cutout cookie! Cut them into any shape you please but make sure to top them off with a generous topping of cream cheese frosting! 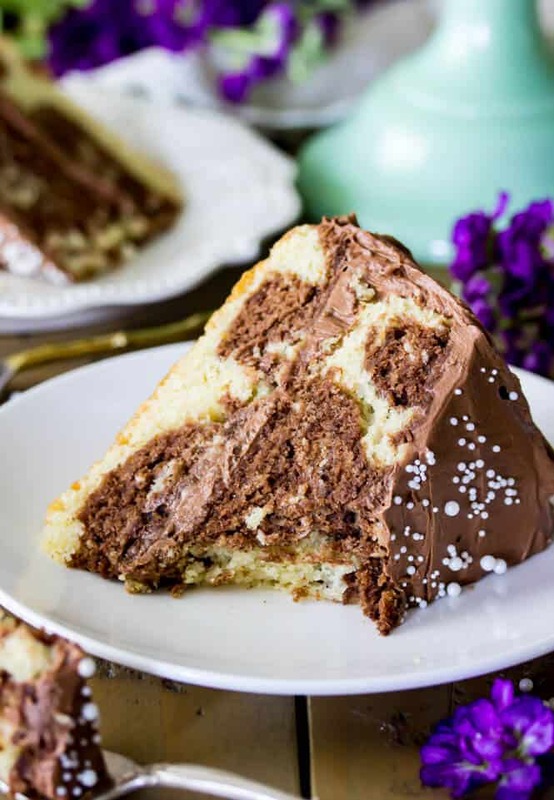 Combine butter and cream cheese and use an electric mixer (or stand mixer) to stir until creamy and well-combined. Add sugar and stir again until thoroughly combined. In a separate bowl, whisk together flour, cornstarch, baking powder, and salt. Transfer dough to a clean surface that’s been generously dusted with flour. Working with just half of the dough at a time, transfer dough to surface and use your hands to form into a ball (add additional flour to the surface if it’s sticky). Use a rolling pin to roll dough to just under ½” thick. 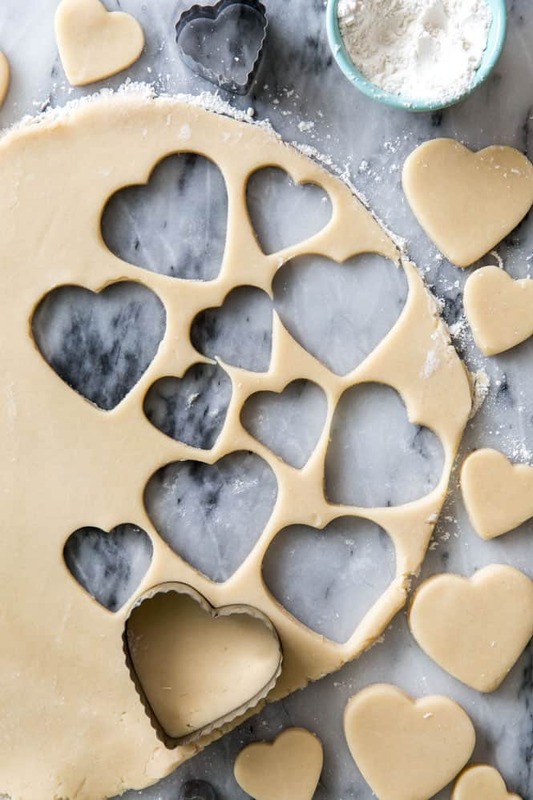 Use cookie cutters to cut into shapes and transfer to prepared baking sheets. Bake in 350F (175C) oven for 8-10 minutes* Allow to cool completely on baking sheet before covering with frosting. Once your cookies have cooled, prepare your frosting by combining butter, cream cheese, and vanilla extract. 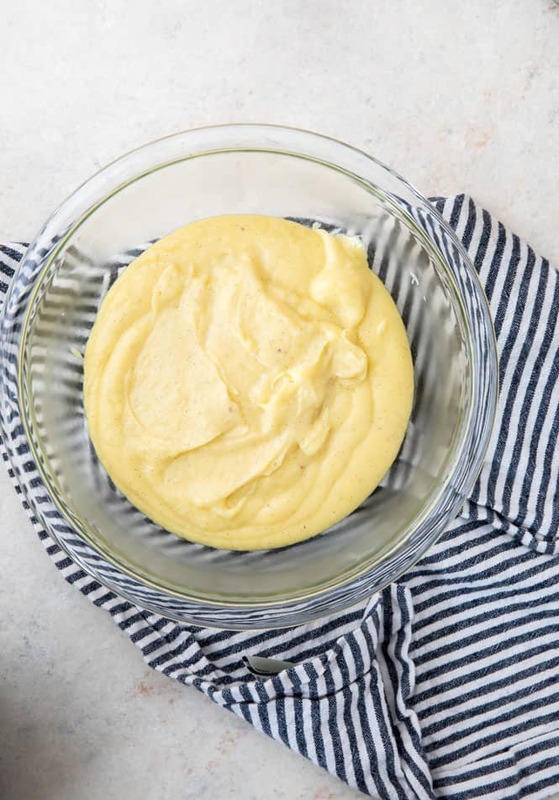 Use an electric mixer (or a stand mixer) to cream ingredients together until well-combined. Gradually (with mixer on low-speed) add powdered sugar until completely combined. Stir in cornstarch (make sure it's well incorporated into the frosting). Spread or pipe frosting over completely cooled cookies. *Baking time will vary if you use smaller or larger cookie cutters. I used heart cutters that were about 3” in diameter. **This is to help your frosting to crust and firm up more than it would otherwise. It will never be completely hard, but adding the cornstarch makes it easier to handle and transport the cookies without the frosting getting ruined.